During the Empowered Committee meeting held on 10th March, 2014, it was decided that a Joint Committee under the co-convenership of the Additional secretary (Revenue), Government of India and the Member Secretary, Empowered Committee should be constituted to look into the Report of the Sub-Group-I on Business Processes for GST and make suitable recommendations for Registration and Return to the Empowered Committee. It was also decided that the Joint Committee should also keep in view the Registration and Return requirements necessary for IGST Model. Accordingly, a Joint Committee, in consultation with the Government of India, was constituted on 7th April, 2014 (Annexure-I). Business Processes held on 22nd and 23rd July, 2015. The report of the Joint Committee on Business Processes on Registration was accordingly finalized. The list of the participants of the meeting of the Joint Committee on Business Processes held on 22nd and 23rd July, 2015 is appended at Annexure-II. Pass on the credit of the taxes paid on the goods or services supplied to purchasers or recipients. A legal person without GST registration can neither collect GST from his customers nor claim any input tax credit of GST paid by him. There will be a threshold of Gross Annual Turnover including exports and exempted supplies (to be calculated on all-India basis1) below which any person engaged in supply of Goods or Services or both will not be required to take registration. Once a dealer crosses the required threshold or he starts a new business, registration application must be filed within 30 days from the date of application in all cases i.e. whether the application has been filed within prescribed time limit of 30 days or otherwise. The taxpayer would be eligible for ITC in respect of all his purchases from the date of application in case application for registration has been filed within 30 days. The taxpayer would, however, not be eligible for ITC in respect of his purchases prior to the date of registration in case the registration application is not filed within the prescribed time limit of 30 days, although Centre is of the view that such a provision may not stand the test of judicial scrutiny. On the other hand States, based on their experience under VAT, were of the view that having relevant provision in the GST law has helped them contest cases in courts. GST Law Drafting Committee to make provision relating to eligibility for ITC accordingly as well as for levying penalty in case of a dealer failing to register within the stipulated time period. However, such person with all-India gross annual turnover below the threshold turnover would be allowed to take registration, if he wants to. By taking such voluntary registration he can enter the credit chain even prior to crossing the threshold limit, provided he does not opt for the Compounding scheme (as defined below). There will be another relatively higher threshold of Gross Annual Turnover (to be calculated on all-India basis) to be called Compounding turnover up to which the registered person can opt to pay tax at a specified percentage of the turnover, without entering the credit chain. Such registered person will neither be allowed to collect tax from his customers nor claim any input tax credit. Compounding dealers shall remain under compounding scheme till their turnover crosses under the compounding scheme. However, if the compounding dealer opts out of compounding in a financial year, for any reason, but eligible and wish to avail compounding in the next financial year, such dealer will have to apply afresh for compounding in the beginning of the financial year in which he wishes to claim compounding scheme. All other taxable persons will be required to take GST registration. Such persons will be able to take the credit of taxes paid on inputs / input services / capital goods and pass on the credit of GST to his customers / recipients of goods or services or both. The registered person eligible for the Compounding scheme but opting against the Compounding can pay regular taxes and file tax returns on monthly basis, and thereby make his supplies eligible for input tax credit in the hands of the purchasers/recipients. Irrespective of turnover, if a taxable person carries out any inter-state supply and / or is liable to pay GST under reverse charge, he will be compulsorily required to take registration. Such person shall neither be eligible for exemption threshold nor for Compounding scheme. However, an individual importing services for personal consumption will not be liable to pay GST under reverse charge or register under GST if the GST law so provides. All UN bodies seeking to claim refund of taxes paid by them would be required to obtain a unique identification number (ID) from the GST portal. The structure of the said ID would be uniform across the States in uniformity with GSTIN structure and the same will be common for the Centre and the States. The supplier supplying to these organizations is expected to mention the UID on the invoices and treat such supplies as B2B supplies and the invoices of the same will be uploaded by the supplier. A unique identification number (ID) would be given by the respective state tax authorities through GST portal to Government authorities / PSUs not making outwards supplies of GST goods (and thus not liable to obtain GST registration) but are making inter-state purchases. The structure of the said ID would be uniform across the States in uniformity with GSTIN structure. The supplier supplying to these organizations is expected to mention the UID on the invoices and treat such supplies as B2B supplies and the invoices of the same will be uploaded by the supplier. All existing registered persons, whether with the Centre or State under any of the tax statues being subsumed in GST, would be allotted a GST registration number called Goods and Services Tax Identification Number (GSTIN) on voluntary basis. Dealers who are below the GST threshold will have option to remain in GST chain. GST Law Drafting Committee to make appropriate provision. For each State the taxable person will have to take a separate registration, even though the taxable person may be supplying goods or services or both from more than one State as a single legal entity. Multiple registrations within one State to business verticals [as defined in Accounting Standard (AS) 17 issued by ICAI] of a taxable person may also be permitted, subject to all the verticals being on the same scheme of tax treatment if the GST Law so provides. A supplier who is not registered on regular basis, whether on mandatory or voluntary basis, in other State (s) and desires to conduct business in a particular State for a limited period, will have to obtain registration in that State for that limited period. Such suppliers are known as casual dealers and shall not be allowed to opt for composition scheme. However, the supplier would be eligible to claim ITC on purchases / inward supplies. The period of registration would be mentioned in the registration certificate also. The format of Registration Certificate for such taxpayers is different from the regular taxpayers. Even the application form for registration will have field for ascertaining estimated supplies. Return for such taxpayers would also be different. Such taxpayers would be required to self-assess their likely liability and deposit the same as an Advance Tax. Such amount would be deposited by way of two Demand Drafts (one for Centre and other for State) which would be returned to the taxpayer after he has discharged his final liability. The GST Law Drafting Committee may provide for conditions for registration and tax payment. A Non-resident Supplier is a person who, in the course of business, makes an intra-state supply of goods or services or both, but is not a resident in the state in which he has applied for registration, but is already registered in any other state. Since the Non-Resident Supplier is already registered in another State, there would be an easy way of registering such entities in the State in which registration is applied as Non-Resident Supplier. The provisions applicable on casual dealers (as detailed in para 2.4 above) may apply to them except that no security deposit or advance tax collection may be made in their case. Each taxpayer will be allotted a State wise PAN-based 15-digit Goods and Services Taxpayer Identification Number (GSTIN). 13th digit of GSTIN assigned to this second entity would e '2'. 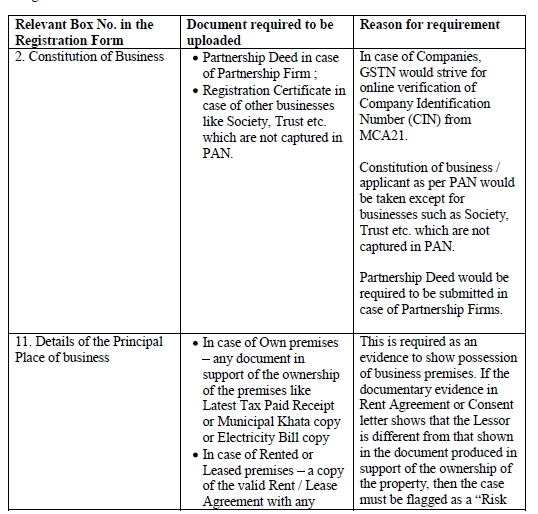 This way 35 business verticals of the same legal entity can be registered within a State. 14th digit of GSTIN would be kept BLANK for future use. Input Tax Credit across the business verticals of such taxable persons shall not be allowed unless the goods or services are actually supplied across the verticals. Any existing taxpayer not under Compounding scheme may opt for Compounding scheme, if eligible, only from the beginning of the next Financial Year. The application will have to be filed on or before 31st March of the previous year so that Returns can be filed accordingly. Compounding dealer may be allowed to switch over to Normal scheme even during the year if they so want, with a condition that they cannot switch over to Compounding scheme again during the same financial year. Any existing taxpayer under the Compounding scheme upon crossing the Compounding threshold will be switched over to the Normal scheme automatically from the day following the day of crossing the Compounding threshold. GST Law drafting committee should provide for a suitable time-period of inputs and capital goods purchases on which ITC would be permitted at the time of switching over to Normal scheme. For the changes covered by (1) to (3) above, the validation in the return module should change automatically under intimation to the concerned taxpayer and both the tax authorities. A suitable validation / dependency of the return module should be established. The above changes should also be published on the common portal in addition to being intimated to other taxpayers who have identified such taxpayer as their counter-party taxpayer. For obtaining registration, all the taxable persons shall interact with tax authorities through a common portal called GST Common Portal2 that would be set up by Goods and Services Tax Network (GSTN). The portal will have backend integration with the respective IT systems of the Centre and States. The procedure prescribed in para 6.0 below is meant for new applicants. The procedure for migration of existing registrants either with the Centre or State or both is dealt in para 7.0 below. A new applicant would be allowed to apply for registration without prior enrollment. Once a complete application is submitted online, a message asking for confirmation will be sent through e-mail and SMS to the authorized signatory of the applicant. On receipt of such confirmation from the authorized signatory, Acknowledgement Number would be generated and intimated to the applicant. Once the application is approved and GSTIN is generated, the same along with Log-in ID and temporary Password will be sent to the authorized signatory. This credential will be permanently used to access the GST Common Portal subsequently. Provision for capturing e-mail and Mobile Number of authorized representative of the taxpayer has also been incorporated in the proposed GST Registration Form. It would be the responsibility of the taxpayer to keep this information updated. Online verification of PAN of the Business / Sole Proprietor/ Partner/Karta/Managing Director and whole time directors/Member of Managing Committee of Association, Managing trustee/authorized signatory etc. of the business would be mandatory and without such verification, registration application will not be allowed to be submitted. Tax Return Preparer (TRP): A taxable person may prepare his registration application / returns himself or can approach the TRP for assistance. TRP will prepare the said registration document / return in prescribed format on the basis of the information furnished to him by the taxable person. The legal responsibility of the correctness of information contained in the forms prepared by the TRP will rest with the taxable person only and the TRP shall not be liable for any errors or incorrect information. If so provided in the GST law, TRPs would be approved by the tax administration of the Centre and the States and will also be provided appropriate training by them, as per common curriculum to be devised by EC/ GST Council. Facilitation Centre (FC) shall be responsible for the digitization and / or uploading of the forms and documents including summary sheet duly signed by the Authorized Signatory and given to it by the taxable person. After uploading the data on common portal using the ID and Password of FC, a print-out of acknowledgement will be taken and signed by the FC and handed over to the taxable person for his records. The FC will scan and upload the summary sheet duly signed by the Authorized Signatory. This is the system in vogue for submitting TDS returns by more than 2 million tax deductors to the Income Tax Department. Registration of TRP/FC is recommended. Final view may be taken by the GST Law drafting committee on the same. Multiple applications can be filed at one go where a taxable person seeks registration in more than one State or for more than one business vertical located in a single / multiple State(s). For Field No 16 (i.e. Details of Proprietor / all partners / Karta / Managing Director and whole-time Director / Members of the Managing Committee of Association of Persons / Board of Trustees etc.) and Field No 17 (i.e. Details of the Authorized Signatory), verification of PAN with CBDT database and GSTN database will be carried out online before the submitted application is sent to the State/ Centre. In case of mismatch the applicant will be given an opportunity to correct the same. A registration form has been designed and is annexed as Annexure-III. This form should be developed by GSTN as per the standard practices / protocols on IT notified by the Govt. of India e.g. for digitally capturing a postal address, name etc. In case there is no standard practice for any of the field, the same should be developed by the GSTN and form designed accordingly. Fields marked by asterisk in the form are mandatory fields and must be filled by the applicant. Application by UN bodies for getting a Unique Identification Number (ID). In some North-eastern States, individuals (Proprietorship firms) are exempt from Income Tax. However, to obtain GSTIN they will have to obtain a PAN before they can apply for registration under GST. Further Government departments will also be required to obtain PAN if they are required to obtain registration under GST. Under GST regime, registration will not be allowed without a valid PAN. If applicant files application through the Facilitation Center, then the above procedure shall be followed by him through the FC by making available the requisite documents to the FC. The User ID and Password of taxable person will however be forwarded by portal to the e-mail furnished by the taxable person (that of primary authorized signatory) and by SMS to the mobile number furnished by taxable person or by post, if the taxable person so desires. It will not be sent to FC. waiting for receipt of the signed copy of the summary extract. If the signed copy is not received within 30 days, a reminder will be sent through e-mail and SMS to the authorized signatory through the portal. If the copy is not received within 30 days after such reminder being sent, the system will prompt the concerned tax authority to initiate the action for cancellation of the registration. Such cancellation will have prospective effect i.e. from the date of cancellation. GST portal would acknowledge the receipt of application for registration and issue an Acknowledgement Number which could be used by the applicant for tracking his application. Such Acknowledgement Number would not contain the details of jurisdictional officers. Details of any record of black-listing or earlier rejection of application for common PAN(s). Last day for response as per the 3 common working day limit for both tax authorities as set out through Holiday Master. 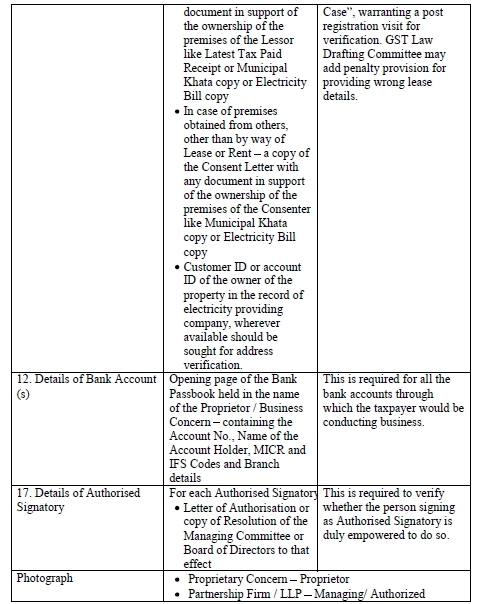 On receipt of application in their respective system, the Centre / State authorities would forward the application to jurisdictional officers who shall examine whether the uploaded documents (as detailed in para 6.3 above) are in order and respond back to the common portal within 3 common working days, excluding the day of submission of the application on the portal, using (Annexure-X). the Digital Signature Certificates. An indicative process for processing of the application by the concerned tax authorities will be drafted and shared separately. Submission of latitude and longitude data in respect of principal place of business will be of help in automatic identification of jurisdictional officer in case of geographically distributed officials mapped on a digital map. However, submission of latitude and longitude would be optional. If the information and the uploaded documents are found in order, the State and the Central authorities shall approve the application and communicate the approval to the common portal within 3 common working days. The portal will then automatically generate the Registration Certificate. Thereafter the processing of registration application will commence resulting in either grant of registration or refusal to grant registration. If either of the two authorities (Centre or State) refuses to grant registration, the registration will not be granted. In case registration is refused, the applicant will be informed about the reasons for such refusal through a speaking order. The applicant shall have the right to appeal against the decision of the Authority. A deeming provision to the effect that rejection of the registration application by one authority amounts to rejection by both Centre and State will need to be incorporated in the GST law. In case registration is granted, applicant can download the Registration Certificate from the GST common portal. GST law may provide that GST Registration certificate shall be displayed at the principal place of business of the taxpayer. The GST common portal will provide a risk profile to the tax authorities based on the risk parameters made available by the tax authorities. The Central/State tax authorities will also have their own risk profile based on their own risk parameters. It was noted that submission of Adhaar No. cannot be made compulsory. Non submission of Adhaar No. could be one of the risk parameters for deciding about the post registration physical verification. On the basis of both risk profiles, the jurisdictional officer of tax authorities will take a decision about post registration verification of the application if so provided in the GST Law. GST Law Drafting Committee may provide for appropriate provision for imposition of substantial penalty in cases of fraudulent registrations. Existing registrants are those who are either registered with States or with the Centre or with both. (1) The process of migration of data must be started sufficiently in advance so that the business of existing registrants does not suffer and transition from the present system to GST is smooth. (2) At present, tax payers are separately registered with State and/ or with Central tax administrations or with both based on their business activity. In the GST regime, a taxpayer will have to obtain State wise registration. Even within a State, the taxpayer may either opt for a single registration or multiple registrations for different business verticals. a) The number of fields in the registration database of various State VAT and CBEC system are different than that finalized for GST. The number of fields varies from 50 to 107 in case of States/Centre whereas GST Registration Form has 120 fields. Thus there is a gap of 13 to 70 fields, meaning that data will have to be collected from the taxpayers. b) As per report of NSDL, which conducted as is study of State Systems as well as that of CBEC, in majority of cases, the available data does not comply with Metadata and Data Standards (MDDS) of Government of India. This is also confirmed by the feedback received from States in May 2015. Importing such data, which is not MDDS compliant, will lead to wrong or incomplete results on query. c) The data from States also shows that they do not have scanned copies of supporting documents for mandatory fields like principle place of business, photos of MD or Karta etc. in their database. This again will have to be collected from them. Since, lots of reports will be using registration database, purity of registration data will be of paramount importance. Migrating half-complete and incorrect data from existing registration databases to GST database will adversely impact the reports and intelligence derived out of it. Thus data will have to be collected afresh from the existing taxpayers. GSTIN can be issued based on State and validated PAN. In case of taxpayers under Excise and VAT, source of data for issuing GSTIN should be VAT data as in most cases Excise assesse will also be registered under VAT. For taxpayers under Service Tax the source of data for issuing GSTIN should be Service Tax. i. GSTIN will be generated by NSDL in case of all VAT TINs where PAN has been validated. Along with a password the GSTIN will be sent to respective State Tax Authorities. ii. State tax authorities will communicate the GSTIN/password to taxpayers, with instruction to log on the GST portal and fill up the remaining data. State specific data over and above what is contained in the GST Registration Form can be collected after GST registration becomes operational. iii. The data so collected by GSTN/NSDL will be provided to States so that they can undertake the verification exercise as per their convenience after 1/4/2016 in a staggered manner spread over a period of one to two quarters so that it does affect the working of the tax authorities. This is being suggested as the dealer is already registered with VAT department. i. Date of birth of proprietor in case of Proprietorship firm. ii. Date of incorporation in case of all other types of dealers. v. In those cases where PAN has not been validated, State VAT department will have to collect the taxpayers. (5) In case of Service Tax, the taxpayers are not registered under a State, a different approach will have to be adopted. I. Since all Service Taxpayers have user ID and password and Service Tax has their email IDs, they may advice the taxpayers to intimate State(s) where they would like to get themselves registered in. II. Service Tax portal will check from GST portal whether GSTIN has been generated for combination of State and PAN of the taxpayer. If not generated, request GST portal to generate the same. III. GST portal will generate the GSTIN and communicate to Service Tax, which will be communicated to the taxpayer asking him/her to provide remaining data at GST Portal. (6) Any verification / updation of the information as outlined above would have to be done by the taxable person within a specified period. (7) If the verification/updation is not done within the stipulated period, the GSTIN will be suspended till the taxable person does the needful. (8) Any verification by State / Central authorities can be done after GSTIN is issued. Dealers below the Compounding ceiling will be provided with an option of availing the Compounding scheme i.e. they can pay the tax at Compounding rate (to be specified) without entering the credit chain. Although the Compounding scheme is only a temporary phase before the taxable person starts functioning as a normal taxable person, separate format annexed as Annexure-V has been prescribed for enabling such taxable persons to opt for Compounding scheme. When the taxable person opts for Compounding scheme he should indicate so in the registration form and GST Common Portal would internally flag him as a Compounding dealer. Later on when he goes out of the Compounding scheme due to his turnover crossing the Compounding ceiling (change will be triggered by the tax return values) or he opts out of the scheme (through an amendment application annexed as Annexure-VI), the said flag will be removed and he would continue operating with the same registration number, without undertaking any fresh registration. Capturing registration information is not a one-time activity and any change in critical information should be entered at the common portal within a stipulated time period. Except the fields mentioned in Para 7.2 (7) above, changes to other registration data can be done on self-service basis. The changes to fields mentioned in Para 7.2 (7) above and a change to Compounding scheme will require submission of reasons and prescribed relevant documents, and will be subject to approval by the concerned tax authorities. All amendments in the details in registration application form will be retained in the database of the GSTN and will be made visible to the tax authorities. (5) Non commencement of business by the tax payer within the stipulated time period prescribed under the GST laws (Suitable provision to be made in the GST law). In case of surrender, the system will send an acknowledgment by SMS and e-Mail to the applicant regarding his surrender of registration and he will be deemed to be unregistered from the date of such acknowledgement. There will be a provision in the system to prompt such surrendered registrants to update their address and mobile number at a prescribed periodicity till all dues are cleared/refunds made. Application form for Surrender / Cancellation of registration is annexed as Annexure-IV. GST Law drafting committee would make appropriate provision for recovery of arrears, other dues and compliance verification pertaining to past periods. (4) The cancellation of registration may be preceded by system generated notice giving 7 days time for furnishing reply by the taxpayer. Principle of natural justice to be followed before cancellation, i.e., giving an opportunity to taxpayer to be heard and passing of order. If the taxpayer approaches the tax authority for revocation of surrendered or cancelled registration, the surrendered / cancelled registration can be revoked. The action for revocation would be initiated by that Authority which has cancelled the registration or had earlier accepted the surrender of registration. The GST Law would contain appropriate provisions relating to revocation / surrender / cancellation of registration. The action for revocation / cancellation of registration would have to be initiated by both Centre and State tax authorities. Once the registration is cancelled by one authority it would be deemed to be cancelled by other authority also. The cancellation or surrender of registration would always have prospective effect. The critical information / documents required from the applicant while making the application has been outlined in para 6.3 above. Here the manner of organization of the said information in the registration form (Annexure-III) has been explained. The form has fields from 1- 21 requiring various details from the applicant. These fields have been organized so that applicant can introduce himself and the nature of his business to the tax authorities in simple interactive manner. To maintain uniformity in the manner of submission of the form, the fields are provided in the standard conventional manner. These can be adopted from the forms notified by the Information Technology department of the Central and State Governments. For example, the legal name can be either a single field or it could be split into first name, middle name and last name. In case there is no standard practice for any of the fields, the same should be developed by the GST common portal. The form is self-explanatory and has online validation facility before the submission of the form. Wherever possible, drop down menu will be provided so that the form is user friendly and there is no dispute about the information submitted. The fields marked with asterisk are the critical fields and need to be filled before the form can be submitted to the portal. In case of non-availability of the information such as PAN Number with the applicant, the common portal will direct the applicant to the website of the income tax department where he can submit the application for obtaining the PAN and after obtaining PAN, can apply for registration under GST. Fields 1-5 are the basic introductory fields and need no explanation. Field 6 is relevant for taxable persons opting for Compounding scheme. Field 7 asks for date of commencement of business in the State in which the taxable person is applying for registration. As has been discussed earlier, the taxable person in the GST regime will be required to take State specific single registration for CGST, IGST and SGST purposes (multiple registrations in a state for business verticals are permitted) . Field 8 asks for the date on which liability to pay tax has arisen. Field 9 asks for the details of time period for which registration is required by the casual dealers. Field 'From' - 'To' - will be mandatory for casual /non-resident dealers in the registration application. For others field 'Form' only would be mandatory. Field 10 captures the reason for such liability. This field would not be enabled in case of registration application by casual/non-resident dealer. Field 11 is for the existing registrants. They have to indicate the details of their existing registrations, so that information already available in the respective data bases can be culled out and made use by the tax authorities for granting new registration to the applicant under GST. (1) He will make available all the records to the tax authorities when called for. (2) The tax authorities will serve all the communications, notices, orders etc. and service of the communications, notices and orders at this place will be treated as legal service of such communications, etc. Field 13 seeks the details of the Bank Accounts of the applicant. The taxable person is required to disclose the details of all the bank accounts maintained by him for conducting his business. Field 14 and 15 ask for the details of top 5 goods or services (in terms of turnover or any other parameter to be specified by the GST Law drafting Committee) which taxable person is supplying or likely to supply. Field 16 captures details of the additional places of business. In this field the applicant has to give the details of all the places from where he conducts the business. Field 17 asks for the details of Proprietor, partners, Karta, Directors, Member of Managing Committee of Association, Managing trustee etc. of the business depending on the constitution of the business. Field 18 asks for the details of the authorized signatory. Field 19 asks for the details of authorized representative (TRP / CA/ Advocate, etc.) of the taxpayer. Field 20 is kept to capture any State specific information, if so provided in the GST law. Field 22 is the field for verification and declaration made by the applicant about correctness of the information submitted by him in the registration application. GST Registration online in India | LegalRaasta, GST or Goods and service tax registration in Delhi, Gurgaon and other cities at best prices. LegalRaasta is online guide for GST registration.